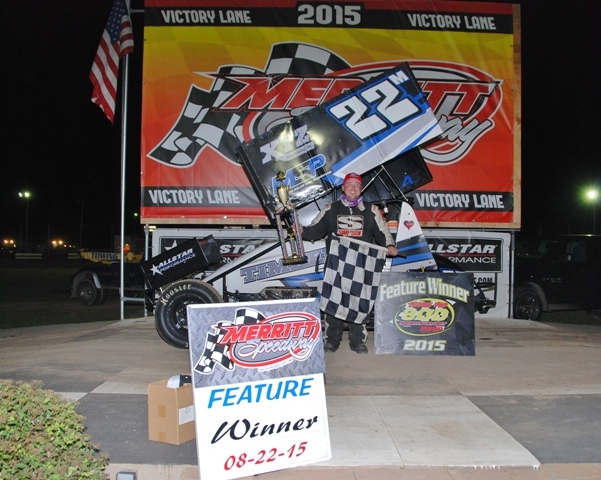 Merritt, MI — (August 22, 2015) — Dan McCarron picked up his first career feature win in the Engine Pro Sprints on Dirt presented by ARP feature Saturday night at Merritt Speedway. Andy Teunessen jumped into an early lead from his 2nd place starting position while pole sitter, Brad Lamberson, retired early due to mechanical issues. Teunessen maintained the lead until lap 18 when he got high coming out of turn four and Gregg Dalman was able to pass him for the lead. In the meantime, McCarron had worked his way up to 3rd and was challenging the two front runners for the lead. As the leaders were working through heavy lapped traffic, McCarron was able to slip by both Teunessen and Dalman on lap 20 to pick up the win. 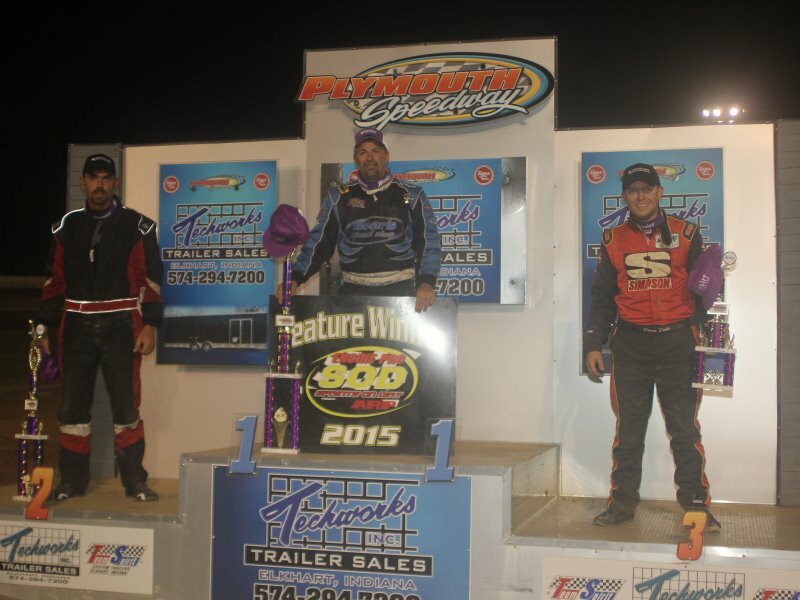 Gregg Dalman, Andy Teunessen, Kyle Pitts, and Craig Karazim rounded out the top five. Heat race winners for the field of 22 cars were Dan McCarron, Robert Huisken and Brad Lamberson. Feature: 1. 22 – Dan McCarron, 2. 49T – Gregg Dalman, 3. 31 – Andy Teunessen, 4. 7K – Kyle Pitts, 5. 4 – Craig Karazim, 6. 46 – Robert Huisken, 7. 48 – Mike Burkin, 8. 19 – Brett Mann, 9. 77X – Alex Hill, 10. 1A –Mark Aldrich, 11. 23G – Joe Geibe, 12. 20A – Andy Chehowski, 13. 27X – Jared Lamberson, 14. 47 – Brian Smith, 15. 21T – Troy Chehowski, 16. 84 – Kyle Poortenga, 17. 24 – Eric Smith, 18. 89 – Chris Pobanz, 19. 16B – Dakota Busche, 20. 27 – Brad Lamberson. Jared Delong, the pole sitter, jumped out to an early lead during the Engine Pro Sprints on Dirt presented by ARP feature at Plymouth Speedway on Saturday. Racing came to a temporary stop on lap 3 when the 77 car driven by Zane DeVault hit the inside berm taking a nasty tumble on the front stretch. DeVault walked away from the crash, however, his car was too damaged to continue. The restart saw Delong maintain his lead until lap 5 when Phil Gressman in the 28H was able to round off Delong coming out of turn 4. The caution flew on lap 7 for Brad Lamberson in the 27 who slowed on the track. Lamberson retired due to mechanical issues. 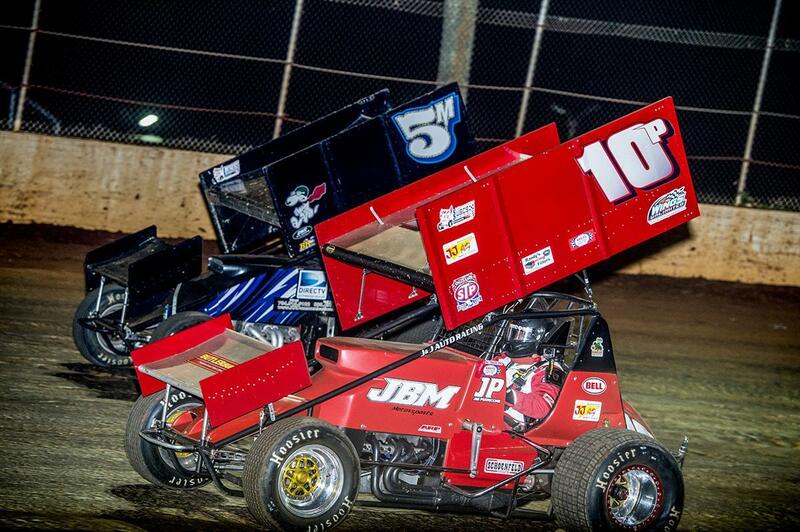 The field was pulled back when Gressman jumped the restart, putting the 10J of Jared Delong back into the first place position. Delong maintained the lead until lap 16 when the 28H of Phil Gressman was able to pass him. Gressman led the remaining 9 laps while Delong continued to challenge him for the first place position with Devon Dobie in the 23 running a close 3rd. Comp Cams / Late Automotive Heat Race #1 (8 Laps): 1. 49 – Shawn Dancer, 2. 49T – Gregg Dalman, 3. 30A – Andy Chehowski, 4. 27J – Jared Lamberson, 5. 21T – Troy Chehowski, 6. 70 – Jim Lingar. Kistler Racing Products Heat Race #2 (8 Laps): 1. 28H – Phil Gressman, 2. 10J Jared DeLong, 3. 11G – Luke Griffith, 4. 36A – Kevin Atkins, 5. 51 – Oscar Smith. Engine Pro Feature: 1. 28H – Phil Gressman, 2. 10J – Jared DeLong, 3. 23 – Devon Dobie, 4. 49 – Shawn Dancer, 5. 20A – Andy Chehowski, 6. 11G – Luke Griffith, 7. 36A – Kevin Atikins, 8. 19J – Linden Jones, 9. 49T – Gregg Dalman, 10. 27J – Jared Lamberson, 11. 21T – Troy Chehowski, 12. 23X – Jimmy Paige, 13. 7K – Kyle Pitts, 14. 27 – Brad Lamberson, 15. 24 – Eric Smith, 16. 77 – Zane DeVault, 17. 70 – Jim Lingar, 18. 16B – Dakota Busche. Albuquerque, NM – (August 10, 2015) – With hot weather in the south the JBMotorsports 10P team are heading north for cooler weather and a chance to invade NRA/SOD territory. First stop will be Jim’s first visit to Limaland Motorsports Park on Friday for the NRA season final race of the year. Secondly on Saturday night will be a second new track as the team will travel over to Plymouth Speedway in Indiana for the Sprints on Dirt regular show. The last time Jim got to run against front runner Ryan Ruhl was at the Winternationals during East Bay Raceway speedweeks. Jim now resides in Albuquerque, NM and will be making the trip North to invade and take on the best that both NRA and SOD have to offer. Come out and meet the team. Montpelier, In. 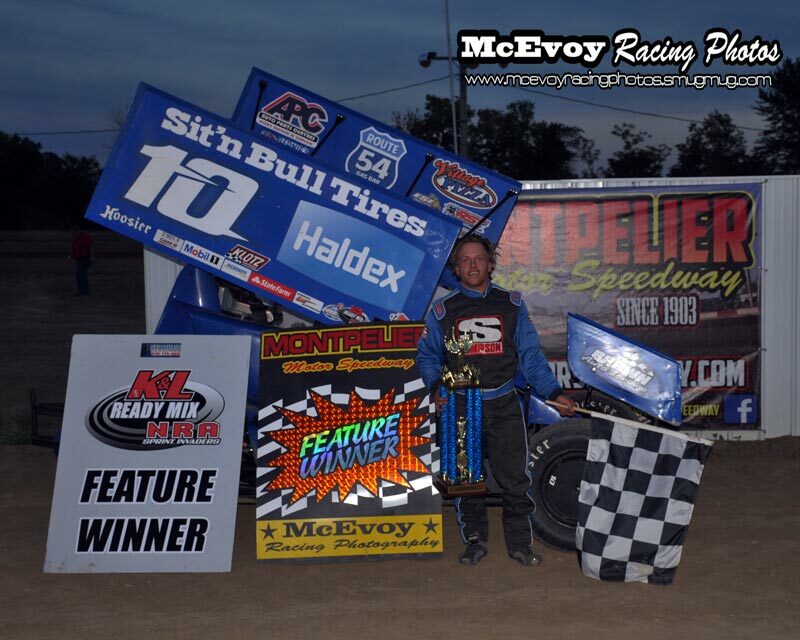 – (August 1, 2015) – Mitch Brown used his outside front row starting position to power to the lead from the green flag and went on to an impressive Engine Pro Sprints on Dirt presented by ARP vs K&L Ready Mix NRA Sprint Invaders win at Montpelier Motor Speedway Saturday night. As the feature was forming, the 12R of Nick Roberts encountered trouble and took a spill in turn four, but made some hasty repairs and made it back out to start the A with a crumpled wing. Pole setter Kyle Sauder took the green for the 25 lap event and as the field came off turn two, Max Stambaugh lost power in the middle of the pack but luckily all cars were able to avoid contact. Stambaugh was finished for the night though. A complete restart was in order and things heated up quickly with Brown and Sauder completing lap one side by side with several cars making contact behind the leaders, however the green stayed out. Brown took command early on and stretched his lead some over Sauder with Hud Horton 3rd and Tyler Moore 4th as Phil Gressman, Jared Horstman and Tim Allison were all dicing for 5th. As the 10th lap was completed, Gressman and Horstman made contact at the stripe with Horstman spinning and bringing out the only caution of the feature. As the green appeared again the order was Brown, Horton, Sauder, Moore and Gressman. Now the 23 of Devon Dobie who started 11th was on the move and took 3rd over on lap 12. Brown maintained the top spot as racing behind him continued to be intense with now 10th starting Shawn Dancer entering the fray and moving in on Sauder. As the white flag flew, Brown was not challenged but at the checkers it was Horton, Dobie, Dancer and Sauder all under a blanket behind Mitch Brown. Engine Pro Feature (25-Laps): 1. 10 – Mitch Brown, 2. 17H – Hud Horton, 3. 23 – Devon Dobie, 4. 49 – Shawn Dancer, 5. 83 – Kyle Sauder, 6. 6S – J.R. Stewart, 7. 11 – Tim Allison, 8. 28H – Phil Gressman, 9. 12J – Tyler Moore, 10. 27 – Brad Lamberson, 11. 17 – Jared Horstman, 12. 49T – Gregg Dalman, 13. 7K – Kyle Pitts, 14. 8J – Jess Stiger, 15. 77 – Zane DeVault, 16. 12R – Nick Roberts, 17. 22R – Kevin Roberts, Jr, 18. 6 – Max Stambaugh.